This work was exhibited as part of Kusozu at the exhibition. Matsui drew the aspects which a female body corrodes, decay gradually and finally return to the ground in the series of this work. However, the series of this work has a scattering vintage. This " Keeping Up the Pureness " was most drawn early in this series. As a work treating the Matsui Fuyuko's grotesque subject matter, it is typical. She drew that a beauty's body decayed. This act of hers makes me surely remember one episode of the controversial story "Dogura Magura" by Kyusaku Yumeno. Although I am unacquainted with the tradition of the China drawing, seemingly, there is such a tradition in Chinese pictures. You will recognize that the body of the woman who was suitable here and lay in the prairie where a flower blooms opened the abdomen, and shows internal organs, when you look at this work. You will regard this aspect as it seeming to be an anatomical chart. If you listen to explanation that internal organs are sticking out of the body about this work without your looking at this work, you will imagine a grotesque scene which is too terrible to look at. If you see this work, you will not actually feel displeasure for this work. Although this work is grotesque in respect of a subject matter, in expression, it sublimates in arts. As for internal organs, Matsui is sketching each portion perfectly like an anatomical chart in this work. However, since she has abstracted them as a form, she does not give a reality. For this reason, you cannot feel this work unpleasant but can think that it is beautiful. The draft sketch of these works was also exhibited at the exhibition. The sketch of her internal organs was exact and was the brilliant thing which is looking at a part of Leonardo da Vinci's sketch pad completely. The common feature of a sketch of her and da Vinci is a point of copying the form of internal organs faithfully, more than the wonderfulness of depiction. Da Vinci has recognized only what was seen by the eye. Carl Jaspers defined him as "existence as an eye." He did not get interested in the deep concept which is not seen to eyes, and man's feeling. 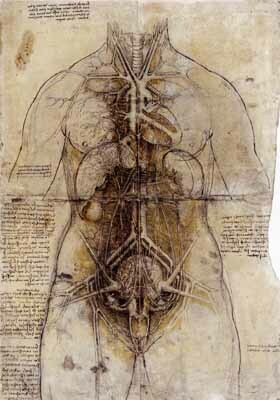 If you compare it of Matsui's draft sketch and da Vinci to internal organs, the impression which both resemble will be received. With this work, she put in order the internal organs of the perfect outside as shown in an anatomical chart, and drew the female body like an anatomical model of the human body. She likened the female body with the vessel and put the internal organs of the perfect outside in order as parts of a doll. She gave the outside made strong to the internal organs which are parts. On the other hand, she did not draw bloodshed. When you look at a body in this work in you, you feel neither a reality nor ghastliness, or a feeling does not worsen. She idealized and drew it rather than drew an actual body realistically as it was. She utilized the feature of the Japanese painting well then. The features of the Japanese painting in this case are external and superficial. There is no materiality filled to the presence of oil painting here. Even if you look at this work, you feel neither resistance nor a feeling of repulsion. Probably people can receive this work widely and it will feel uniqueness for having made into the theme the grotesque subject matter which other painters do not take up. And those who look at this work will think that there will be some special reasons to such the unique theme being chosen. 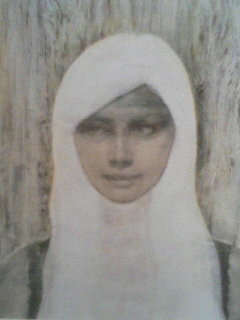 This work pokes up people to inquiry skillfully. Thus, she is performing this strategically. When it adds, and a young and beautiful female painter named Matsui has exposed to media, people's inquiry will be urged further. 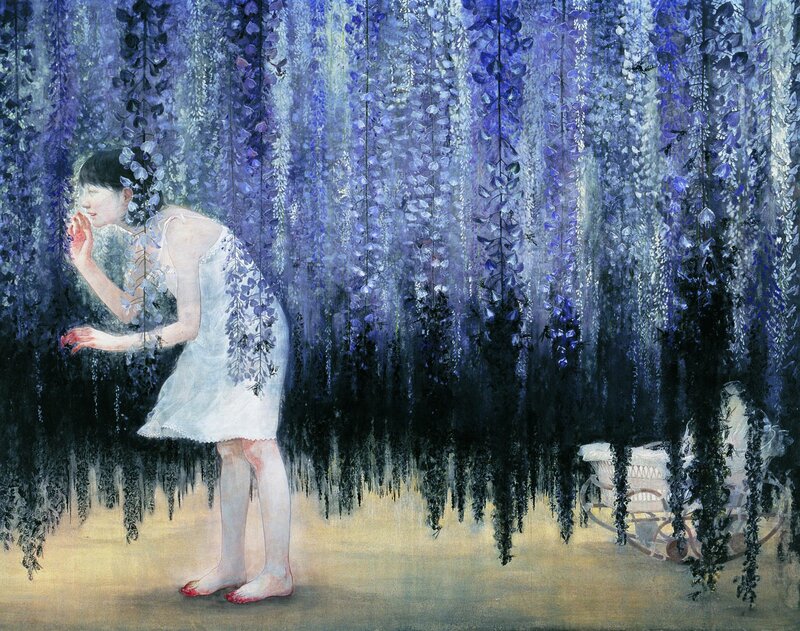 Even if you look at the Matsui's work, you are not made to overwhelm only with a sensuous pleasant sensation of your vision with this work. She drew this work well by the sketch with a perfect outside. You want to come to say. "it is beautiful. however, what happens to the point? " I think that this work has the charm which can play with language mentally in the point of the theme and composition. For example, this work bears a strong resemblance to "Ophelia" by the Pre-Raphaelite's Brotherhood JE Millet at the point of the composition of the whole pictures. "Ophelia" is the work which the girl threw herself into the flow of the river where a flower blooms all over, and described signs that it passed. 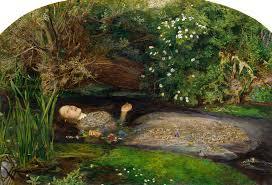 In "Ophelia", the expression of the girl who there is already no light in eyes and is hollow is wrapped in the transparent feeling which cannot be regarded as the thing of this world, and is setting adrift the premonition which collapses away also easily after the instant with transitory beauty. Also in this work by the Matsui , the woman lay and it has turned to the place where a flower blooms all over here by the hollow eye. The composition that a girl lies in the flower in this work is associated with "Ophelia." 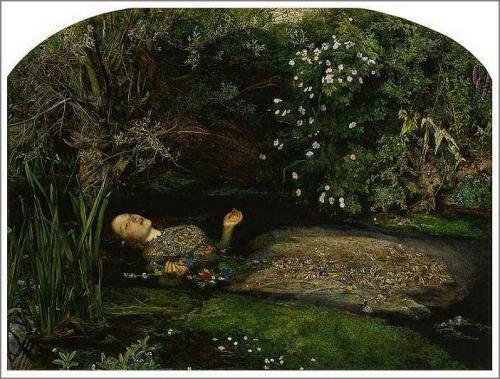 Probably "Ophelia" is remembered and it compares with this, when you look at this work. Although it is the same composition, you are surprised that this work has grotesque "Ophelia" compared with clear and transitory one. Matsui is making the production which emphasizes the grotesqueness of this work contrastively in this way. She is making full use of a technique called quotation here. The technique which Matsui used is the same as the technique which the painters who tried to make the intellectual and artificial fabrication world of Rene Magritte or Gustave Moreau used. This resembles the technique of the elaborate adaptation from a famous poem in a 31-syllable Japanese poem. Those who touch the poetry using this technique enjoy the change in the original world and the world by quotation. Those who do not know the original world also touch the poetry, and enjoy the atmosphere which is likely to have a background somehow. Here, the mechanism of the fiction built only by means of language is hidden. Those who enjoy such poetry can separate from reality, and can play in the world of a pure image. One of the causes in which this work does not give a reality is because it is a Japanese painting. The characteristic of this work described so far is collected by that this work is drawn as a Japanese painting. She has chosen the genre of a Japanese painting strategically. She will choose one of the form of a religious painting or romanticism, when she tries to draw a symbolic expression by a Western picture on the topic of the body which put internal organs. It will be transcendental character whichever she chooses. The transcendental thing does not have a clear shape. So, she will try symbolic illusion drawing or a subjective abstract painting, when she draws it. Such picture form is crabbedly reflected for those who see. Since people can receive a work widely, she dared to have drawn this subject matter by the representational painting. Her work is the thorough representational painting. She draws each parts based on a faithful sketch. The sketch which she draws copies the target outside correctly. However, when she draws a sketch, she searches for neither textures nor presence, but asks only for the accuracy of an outside. It seems that this relates to the image of the ideal which Aristotle claimed that the essence of existence is in a look. She makes a work constitute combining the parts of an exact outside like a puzzle. The work which she means fits the plane nature to which the outside of parts becomes clear rather than textures or solid composition. So, she chose the genre of the Japanese painting. In the genre of a Japanese painting, actually carrying out the sketch of the subject matter is not thought as important. The painter of a Japanese painting draws it in accordance with the rule beforehand decided to the subject matter. For example, the pattern in which flowers-and-birds drawing is drawn for every kind of flower is decided. People do not care about whether the drawn flowers-and-birds drawing contradicts the actual flower. If the person who looks at flowers-and-birds drawing considers that the flower is drawn, flowers-and-birds drawing will be materialized. The Japanese painting is realized after the relation of a promise with those who regard as those who draw. She was able to design the combination of the parts which traced the outside, without carrying out realistic depiction, since the grotesque subject matter was drawn as a Japanese painting. She quoted the pattern well known by the whole composition to people. Then, people came to receive this work easily. Furthermore, some people were able to read the inconsistency between the original meaning of a pattern, and the peculiarity of the subject matter of this work multistory. As a result, she was able to give depth to the contents of this work. This became possible just because it was a Japanese painting. In this work, by dealing with a grotesque subject matter, she attained differentiation and made it popular by moreover drawing as a Japanese painting. I feel her strategy strong for this work. I am enjoying pursuing her strategy story, looking at this work.